SeeSaw video-on-demand IPTV service launches today | What Hi-Fi? 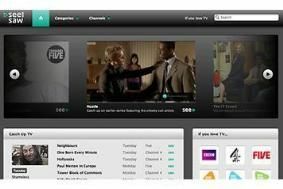 The service has been built by SeeSaw owner Arqiva, the broadcast transmission company, from the assets of BBC Worldwide, ITV and Channel 4's defunct Project Kangaroo IPTV service. SeeSaw has content deals for seven-day catch-up programming with Channel 4 and Channel 5, but not ITV. The VoD service will also show archive programming from BBC Worldwide and some ITV programmes from independent producers. Viewers can watch progarmmes on SeeSaw for free, and the company is promising no display advertising and few ads within programmes, with commercials focused on the pre- and mid-roll video slots. The company says it expects to add a further 2000 hours of content by the end of June, when it plans to start charging for some programmes, most likely US shows.